Survival Analysis for Bivariate Truncated Data provides readers with a comprehensive review on the existing works on survival analysis for truncated data, mainly focusing on the estimation of univariate and bivariate survival function. The most distinguishing feature of survival data is known as censoring, which occurs when the survival time can only be exactly observed within certain time intervals. A second feature is truncation, which is often deliberate and usually due to selection bias in the study design. Truncation presents itself in different ways. For example, left truncation, which is often due to a so-called late entry bias, occurs when individuals enter a study at a certain age and are followed from this delayed entry time. 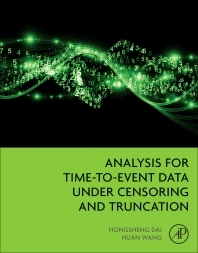 Right truncation arises when only individuals who experienced the event of interest before a certain time point can be observed. Analyzing truncated survival data without considering the potential selection bias may lead to seriously biased estimates of the time to event of interest and the impact of risk factors. Lecturer, University of Essex, UK. Huan Wang is a Statistician and Epidemiologist, at the Dundee Epidemiology and Biostatistics Unit, Population Health Sciences, at the University of Dundee, UK. He received his BSc in Mathematics and Applied Mathematics, from the Harbin Institute of Technology, P.R China. He received his MSc in Applied Statistics from Lancaster University, U.K and completed his PhD in Mathematic Sciences at the University of Brighton, UK.